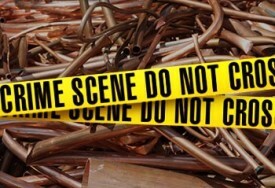 Tips for Preventing Copper Theft - Guru Security Inc. Many people don’t realize the impact that this theft can have. Not only does the theft result in criminals making money off someone else’s loss, but the damages of removing these pipes, tubing, and lines can reach into the hundreds of thousands of dollars range. For some businesses, overcoming this type of loss is impossible. The good news is, there are a few steps that can be taken to help prevent your business becoming a victim of copper theft. Put up a strong, lockable fence. Make sure you further protect units that have copper present with a large fence. While this isn’t foolproof, it is better than no security at all. You may even consider doubling the fence with a barrier of barbed wire. Install an alarm system. A business alarm system can be installed, and an alarm will be triggered when someone tries to break-in. You can then have a code sent pinpointing the sensor that was activated. You can also install audio detectors to report any strange sounds. Install video surveillance or monitored security cameras. Virtually all instances of copper theft take place at night, or when the business is closed. A security camera can provide you with a visual of the crime and even be accessed remotely. This minimizes the potential of a thief getting away with it.